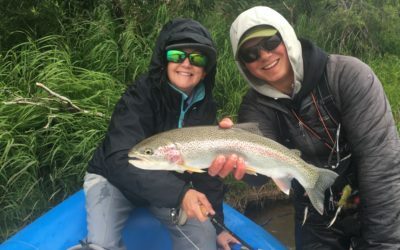 When we started out on this three year “River Ramble” to fish the Trout Unlimited’s Guide to America’s Top 100 Trout Streams, we knew we were saving the five rivers in Alaska for last. The other 95 were “easy” in comparison, as we were able to drive to every one of them. Alaska posed a bit of a different problem as you can see from our cover photo for this post. We have to fly, on float planes, to get to several of these last 5 rivers. So on Friday (July 20), instead of firing up the SaraLinda and heading out, we are headed to Bozeman-Yellowstone International Airport and heading north for “30 Days in Alaska”. We’ve been advised by all the places we’re staying in Alaska to bring the usual…. rods/reels, waders/boots, polarized sunglasses, fav fishing hat, comfy clothes and necessary meds/toiletries. Additionally, we were told to bring…. a mosquito net for our heads, 95% DEET bug spray and, of course, we’ll have bear spray with us. While our guides will likely be packing heat, we’ll definitely be packing bear spray. As we’ve been planning our trip, we got out the maps to see just exactly where we’re going. Alaska is our largest state in land mass and our most sparsely populated. As you can see from the map (pic 1 above), it’s bordered by two Canadian provinces to the east (British Columbia & The Yukon), the Arctic Ocean to the north, the Pacific Ocean to the south, and to the west, it shares a maritime border in the Bering Sea with Russia. Remote seems an appropriate description. 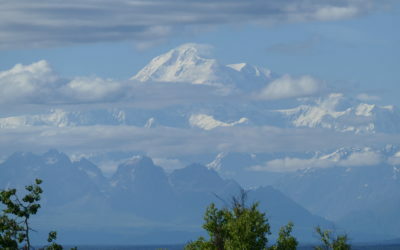 But it’s also the home of our highest peak, Denali, and some of the most breathtaking scenery and wildlife on the planet. While it’s definitely a fishing destination of anglers around the world, “It’s Not About the Fish” applies here as well. We’re really breaking up our time in Alaska into 4 segments (pic 2 above), each with its own unique character. 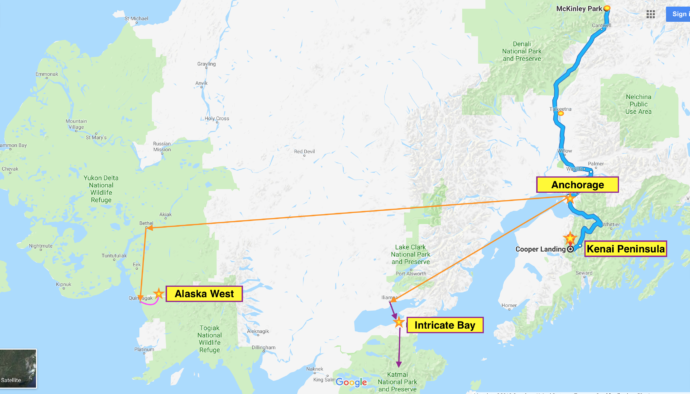 After a short stop in Anchorage, we’re off to Intricate Bay on Lake Illiamna for a week of fishing in which we’ll check off two of the five rivers, the Alagnak and the Copper. 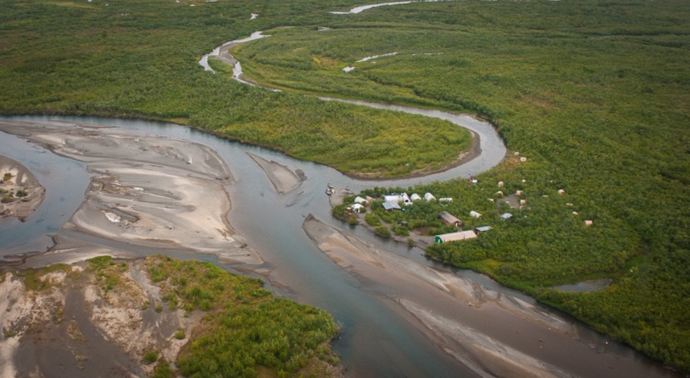 But just to get to fish these two rivers, it requires a “normal” plane ride from Anchorage to Illiamna airport followed by a float plane (pic 3) to get to our lodge at Intricate Bay. Fishing the Copper River will be easy as the lodge is located near where the Copper flows into Lake Illiamna. 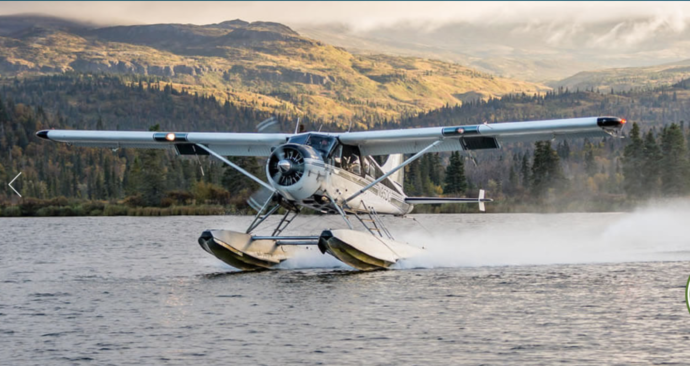 The Alagnak is more of a challenge… aka… a float plane once again to get there. 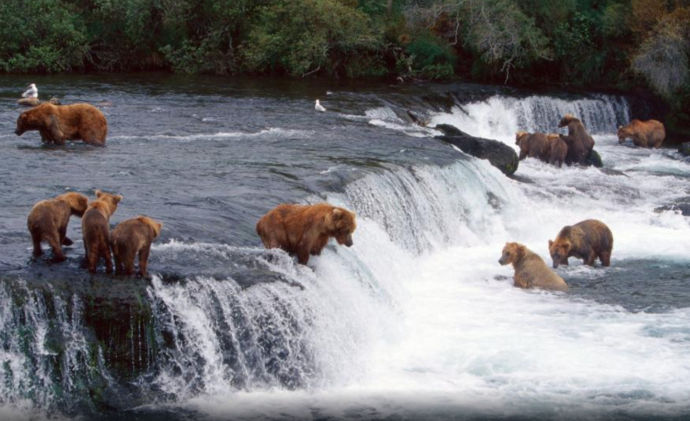 You’ll also notice on the picture, Katmai National Park and Preserve (Brooks Falls in particular, see pic 4), which we’ve been told is a “must see”, along with yet another float plane trip to get there. You can see why the SaraLinda just wasn’t an option. Segment two is all about sightseeing (along with a little fishing of course) along the road between Cooper Landing and Denali National Park and Preserve. 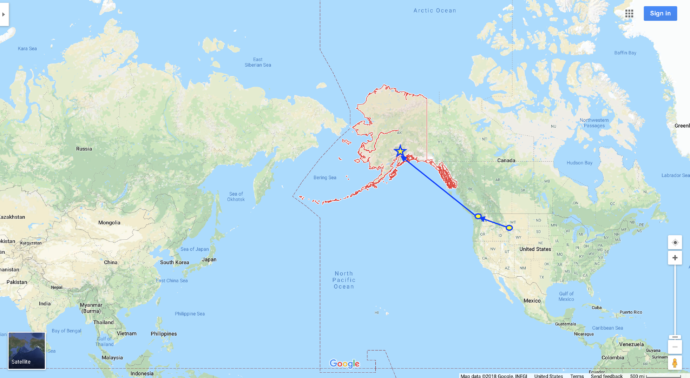 After we get back from the Katmai/Lake Illiamna area, we’re back to Anchorage, then driving down to Cooper Landing to fish the Russian River (one of the Alaska 5) and do some sightseeing in Seward. Then it’s back through Anchorage and up to Talkeetna, which began as an Alaska Railroad town. It’s also a “basecamp” area for exploring Denail and fishing a creek that was recommended to us, Montana Creek. 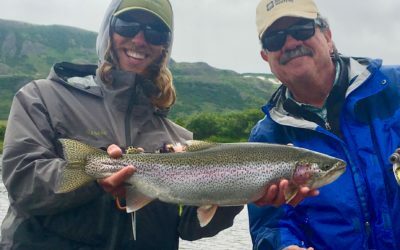 Yes, we’re definitely fishing MORE than just the five TU Top 100 trout streams in AK. Then we’re off to Denali National Park and Preserve for a full day of sightseeing. We’re keeping our fingers crossed the weather will be good and we can actually SEE the mountaintop. After Denail, it’s back to Anchorage for…..
…. Segment three, which requires a flight from Anchorage to the small town of Bethel, another flight to the even smaller native village of Quinhagak and finally, a 30 minute boat ride up the Kanektok River to our next basecamp at Alaska West (pic 5). So far, we’ll have been staying in a room, with four solid walls, but not at Alaska West. Here, we are staying in “tents”, with floors, but basically canvas stretched over a frame that has two single beds inside, a lantern and that’s about it. The bathrooms are “out houses” strategically located around the tent sites. There is a dining tent, a drying tent (for waders/boots), a lounge tent and a shower tent. You can see why they call it a “Tent Camp”… LOL. This is truly an Alaska bush experience, at least as “bush” as we’re willing to try. However, the camp is located directly on the Kanektok River which means, no float planes, just getting into jet boats and moving to various sections of the Kanektok, which is the only river we’ll fish this week. Segment four begins when we boat/fly back from Alaska West to Anchorage. We’ll meet up at the airport with dear friend James Kelley who is coming to Alaska to fish with us for a week on the Kenai Peninsula. 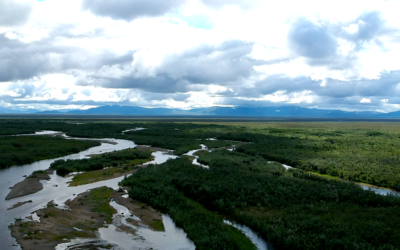 Once we grab our gear from baggage claim, we’re headed back to Cooper Landing to fish the Russian and Kenai Rivers, both on the TU Top 100 list. 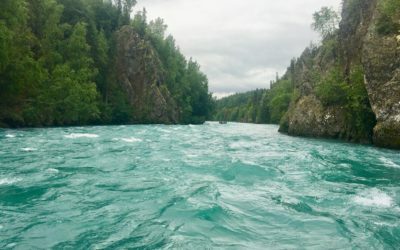 We’ll be floating through the Kenai National Wildlife Refuge fishing the Kenai and hiking along the Russian River. We’re staying in Cooper Landing in cabins along the Kenai River and enjoying all the “fishing, food, friends and fun” we can. After this segment, we head back to Anchorage to catch flights back to Bozeman (Nashville in James case). Our “30 Days in Alaska” will have been complete. However, along the way, we plan to “Blog” on our River Ramble site and/or update our Instagram feed every day (well, at least every day where we have internet access). We hope you’ll follow along with us on our journey to Alaska.